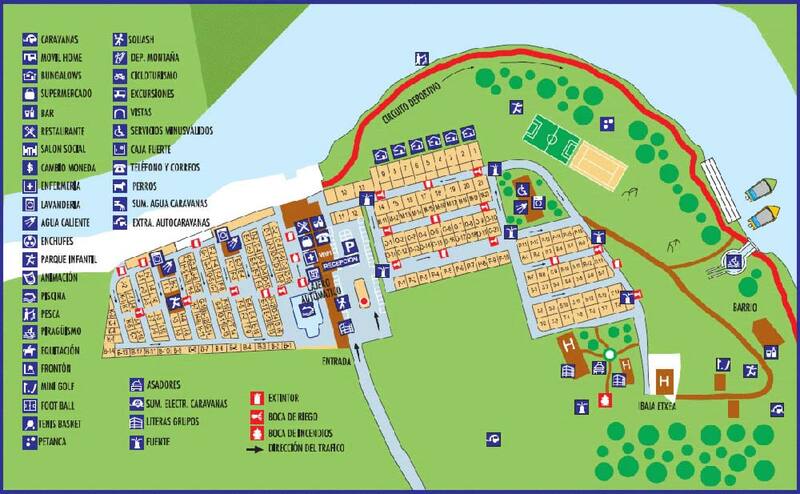 The reservation will not be completed until the camping management has received a bank payment or money order for 30 € (bungalows: July and August: 150 €; rest of the year: 60 €); such receipt will be presented when arriving at the camping. In case you should delay your arrival, please, inform an advance IN WRITING. If we don' t have any written information, the site will be given to someone else the next day at 12:00 o' clock. For the hiring, a deposit of 90,15 € will be required at your arrival for eventual damages and the balance will be returned once the inventary has been done. Bungalows: Entries in July and August At the arrival the hire-objets are at your disposal from 16:00 hrs until 20:00 at the latest, from Saturday to Saturday. The day of departure you have to leave at 11:00 o' clock at the latest. If you wish to prolong your stay beyond the date of departure agreed-on you have to contact the reservation office at least three days before the date of departure. Every cancellation has to be indicated as soon as possible IN WRITING (by telephone will not be accepted). For every cancellation received before the 30th May the deposit will be returned. if notice of cancellation is provided more than 7 days and less than 15 days prior to the date indicated for occupation, the establishment may retain 50% of the amount of advance payment. If notice of cancellation is provided within 7 days of the date indicated for occupation, the full amount received by way of advance payment shall be retained by the camp site. If customers fail to arrive at the establishment before 20.00 h on the day of arrival, they shall be deemed to have cancelled. Only in the case of hospitalization or death of a family member with second-degree kinship, on presentation of the relevant sick note or similar. At your arrival, each person will receive a bracelet. You must wear this badge visible at the swimming pool and in the campsite, so that we can recognize who do not belong to the campsite.